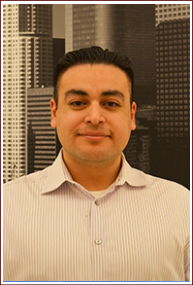 Alan Hernandez is a Paralegal at Klapach & Klapach, P.C. Mr. Hernandez earned his Associates in Arts degree for Paralegal Studies at Los Angeles City College, after which he interned with the Los Angeles District Attorney’s Office. In his spare time, Mr. Hernandez enjoys running, boxing, movies, and photographing the urban landscape of Los Angeles. Mr. Hernandez volunteers with the homeless community in his neighborhood.